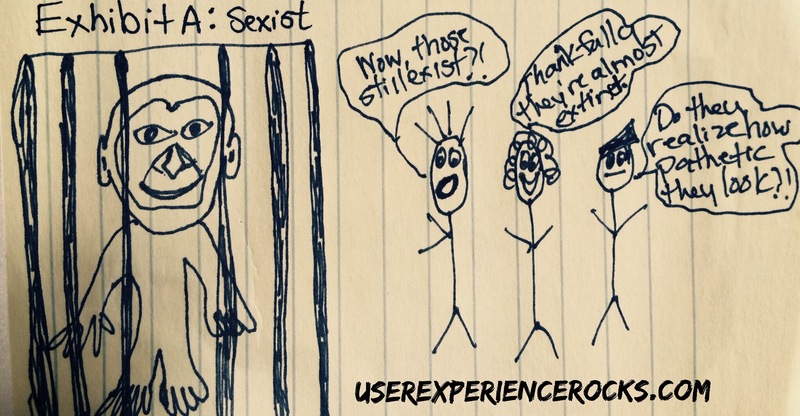 Sexism in the technology industry is a dying phenomenon. Very occasionally you encounter a pitiful male who feels the need to beat his chest like a caged monkey to mask his insecurities which makes him look incredibly pathetic, but it’s a rare occurrence. Thankfully the caged monkeys are being shunned and ostracized into oblivion (as they should be) by the rest of the members of our fab community. Of the last 100 or so community members I’ve interacted with, I’ve only encountered 1 ignorant, blatantly sexist jerk who should probably not be permitted to ever speak again. He basically crucified himself on social media. The rest of the industry was appalled (rightly so) and lit into him immediately. We, as a community, don’t put up with that garbage. Since I’ve only encountered 1 jerk in 100 professional interactions, I’m rocking 99% awesome peer experiences. Other UX/Design/Dev pros are expressing similar percentages, and I’m loving it. Our community really is the best!